Let’s face, we all love the convenience and taste of most Chinese takeout. There is nothing quite like getting an egg roll, some fried rice and one of a dozen or so classic Chinese takeout meals to make things easy and tasty on a weeknight or weekend. I admit we get Chinese takeout about once a month now, mainly because I have found that anything that we really like I can make at home and have it cost a lot less and often times taste better and fresher.I had come across this recipe in the New York Times a while back for a classic Chinese menu meal of Gong Bao chicken with peanuts. This one is so easy to make and only takes a few minutes of your time and you can have a meal that tastes better than your favorite takeout. Cut the chicken as evenly as possible into half-inch strips, then cut the strips into small cubes. Place the chicken in a small bowl. Add all of the marinade ingredients and 1 tablespoon of water to the bowl with the chicken. Mix well and set the bowl aside. Peel and thinly slice the garlic and the ginger. Chop the scallions into chunks as long as the chicken cubes so they match in diameter. Snip the chiles in half or into sections, discarding the seeds. In a small bowl, combine all the sauce ingredients and mix well. Heat a large skillet over high heat. 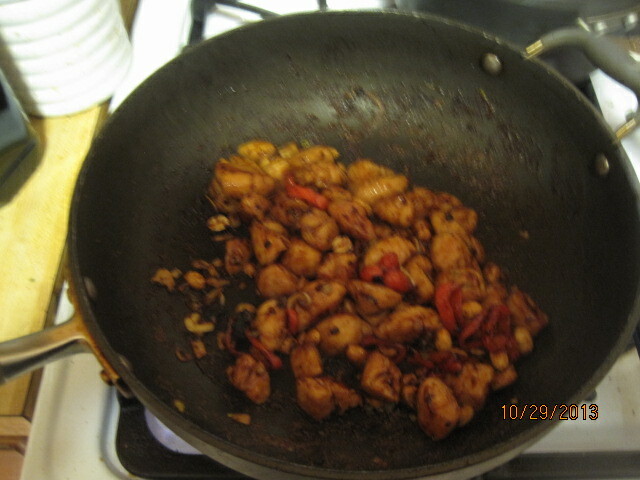 Add the vegetable oil, chiles and Sichuan pepper and stir-fry briefly until the chiles are darkening but not burned. Remove the skillet from the heat if necessary to prevent the pan from overheating. Quickly add the chicken and stir-fry it over high heat, stirring frequently. As soon as the chicken cubes have separated, add the ginger, garlic and scallions and continue to stir-fry everything until the garlic and ginger are fragrant and the chicken is just cooked through, about 2 or 3 minutes. You can test one of the larger pieces of chicken to be sure it is done. Give the sauce a stir and add it to the ingredients in the skillet, continuing to stir and toss the mixture. As soon as the sauce has become thick and shiny, add the peanuts, stir into the mixture and remove the skillet from the heat. Serve. There are a few things about this dish. First, if you can’t find Sichuan pepper (and it may not be readily available), there is a Sichuan oil that you can get instead to use. It doesn’t add any heat to the dish but has a lemony flavor to it. you can always omit it from the dish if you can’t locate anything else. The peppercorns are often used in Chinese five spice powder. The same goes for the dried chiles. My family does not like things very hot, so I simply went with red bell peppers and added some chili oil for a little bit of heat. One thing you do need in this dish is the peanuts. Michelle and I both agreed the peanuts made the dish. They add great crunch and flavor. You can buy already roasted peanuts in the store or you can roast your own in a 250 degree oven for 15 to 20 minutes. Just watch them closely because they can burn pretty easily. 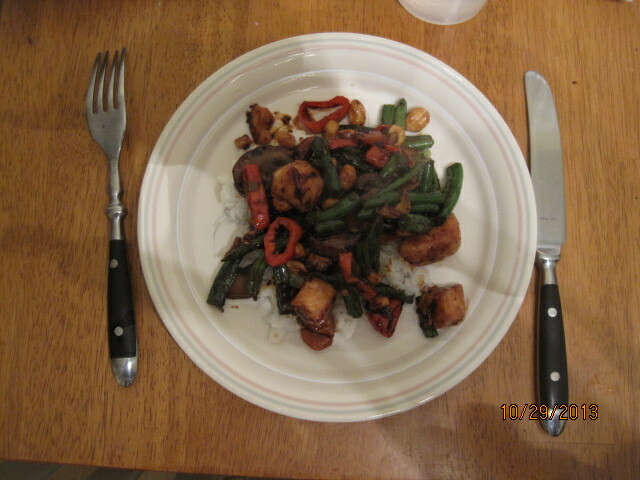 I stir-fried some green beans, mushrooms and carrots in a separate skillet so we had some vegetable with the meal and also served it with white rice. I loved the flavor of the sauce and marinade and the peanuts really gave a lot to the dish. That’s all I have for today. Check back next time for some more recipes. I had hoped to get some Halloween stuff together, but it just didn’t happen with other things going on around here, so maybe next time. however, I did make some homemade peanut butter cups which I will share next time. Until then, enjoy the rest of your day and enjoy your meal and have a happy Halloween!